"EE" redirects here. For the predecessor game with the same abbreviation, see Emergency Everyday. Len'en Mugenri (Connecting Chain of the Unreal Village) ~ Evanescent Existence (連縁无現里　～ Evanescent Existence) is a vertical-scrolling danmaku shoot 'em up and the first game of the Len'en Project. It was made by Trick Nostalgie's sole member JynX and released for the Windows operating system. The trial version was released on 12 September 2013, followed by the full version on 18 November 2013 as a free download. It was developed and released concurrently with the second game in the series, Earthen Miraculous Sword. The game was made with inspiration from the Touhou Project . 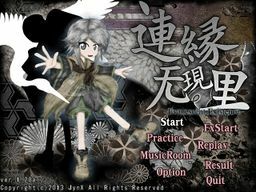 Like the Touhou Project, game titles in the Len'en Project consist mainly of five Japanese kanji, plus an English sub-title that relates to the main title without necessarily being a translation. In the title, "Mugenri (无現里)" is the name of the world that is the main location of the Len'en Project. "Evanescent Existence" refers to the game's scenario, an origin story for the Len'en Project that tells the main characters Yabusame Houlen and Tsubakura Enraku being spirited away to the apparent dream world of Mugenri and how they became protectors of Mugenri. The Japanese title was originally "鏈縁无現里", but it was changed to "連縁无現里" in v1.10 in accordance with Brilliant Pagoda or Haze Castle. Gameplay is very similar to the Touhou Project. There are two playable characters, though the second character must be unlocked by clearing the Extra Stage. There is a main game mode of six stages with four difficulty levels, plus an Extra Stage with three difficulties; clearing the main game on any difficulty unlocks Easy Extra and the normal difficulty Extra, while clearing the main game on Unreal difficulty also unlocks the harder Absurdly Extra. The airheaded Yabusame Houlen and their friends find themselves in a strange dimension. With no clear way out, they all get lost. But then they (except for Yabusame) hear a voice telling them all to seek out the deepest part of this world, where the winner will be granted... something. The game contains a total of 19 tracks composed by JynX, which somewhat mimic ZUN 's style. Similar to the Touhou Project games, the music room hides song names unless you hear them during gameplay, or unless you attempt to select a theme twice in a row in the music room itself. One of the themes wasn't an original song by JynX, but instead by one of their friends, who JynX got permission from to create an arrangement of with the condition that the identity of the specific song is kept a secret. However, JynX states that the identity of this theme is pretty obvious. Theories include the stage 3 theme "Extra Mind" because of its unusual sound, the staff roll theme "Dissipating Fantasies ~ bard_VISION" due to a statement by JynX that the song is an extensive arrangement of an older song, or Tsurubami's theme "Eternal Dance Engine ~ Shall We Dance!!" due to it sounding similar to Daijin's theme "SAVE the GAME" from Emergency Everyday. JynX originally spent their time creating mockups of remakes for the PC-98 Touhou games; to illustrate that these were simply mockups, they were released on or around April Fools. However, eventually JynX wanted to make a real "Touhou-like" project, which became the series that we now know as the Len'en Project. They tried to make entirely original resources and styling that still tried to mimic the Touhou Project. The game is made for Microsoft Windows and DirectX, and it was JynX's first time programming in object-oriented C++, using the DX Library to easily link one into the other. JynX admits that development of Evanescent Existence and Earthen Miraculous Sword was complicated, drawing a lot of drafts for any detail. An initial trial version of the game, v0.01a, was first released on 12 September 2013. Later on, the full version, v1.00a, was released on 18 November 2013 alongside Earthen Miraculous Sword. Both games were released simultaneously because JynX believed that the story for Evanescent Existence didn't have much meaning if played on its own. On 2 March 2014, v1.01a was released as an update patch, containing unspecified bugfixes. On 14 October 2017, v1.10a of the game was released. This update implemented the flash bomb mechanic, rebalanced various attacks in the game, and opened the game's text and image resources to allow for easier translation. It also introduced Suzumi Kuzu as an unlockable third player character. On 2 June 2018, the game was further given a new "Light Level" mode. More to the story is that Evanescent Existence is a substantial overhaul of a much earlier project, Emergency Everyday. The two games share many similarities in things such as character, game title, and stage design; the mysterious arranged song mentioned above may be from this original project. Additionally, the developer of the older project (Daijin) is always credited as special thanks in Len'en titles. This page was last edited on 29 September 2018, at 16:56.